When you think of aloe vera, it's likely that you immediately call to mind those accidental vacation sunburns of your youth. You know the ones—when a grown-up warned you to put on more sunscreen but you were either having too much fun, couldn't be bothered, or you were determined to arrive back to school with some sort of sunlit glow. (I fell into the first and third category, depending on the year and vacation destination.) It would undeniably result in angry, red, and irritated skin. That's when you started rummaging through the medicine cabinet looking for a cooling bright-green drugstore gel to slather on. Since then, though, aloe vera's alternate uses have become more varied and widely known. People use it as an acne treatment and to soothe upset stomachs and expedite the digestion process. It can even be used to treat dry and damaged hair. The latter is what we're currently interested in, which is why we enlisted the help of three hair experts to tell us more about this under-the-radar and all-natural hair salve. Hint: It's as easy to use as it is effective. According to Chelsea Scott, hair expert and founder of Truhair, "Aloe vera has been used for thousands of years in many cultures for its hydrating benefits to skin and hair." Just like how it soothes and hydrates skin while providing healing vitamins and nutrients, it can similarly boost the health of your hair. It's all thanks to its chemical makeup. It has vitamin A, C, and E, which are all antioxidants that neutralize damaging free radicals. It's also a naturally occurring source of vitamin B, which you may recognize from various hair, nail, and skin beauty supplements. Minerals like calcium, chromium, copper, selenium, and magnesium are present, along with various fatty acids. Scott, though, specifically calls out the plant's natural enzymes. "It is made up of proteolytic enzymes," she says. "These enzymes help to moisturize both the scalp and hair. Aloe vera has the ability to attract and lock in moisture, which is especially beneficial for extremely dry, brittle hair." Jana Blankenship, founder of Captain Blankenship, has formulated many of her namesake products with aloe vera because it is so moisturizing and gentle. "It also acts as a great leave-in conditioner and leaves your hair all smooth and shiny," she says. 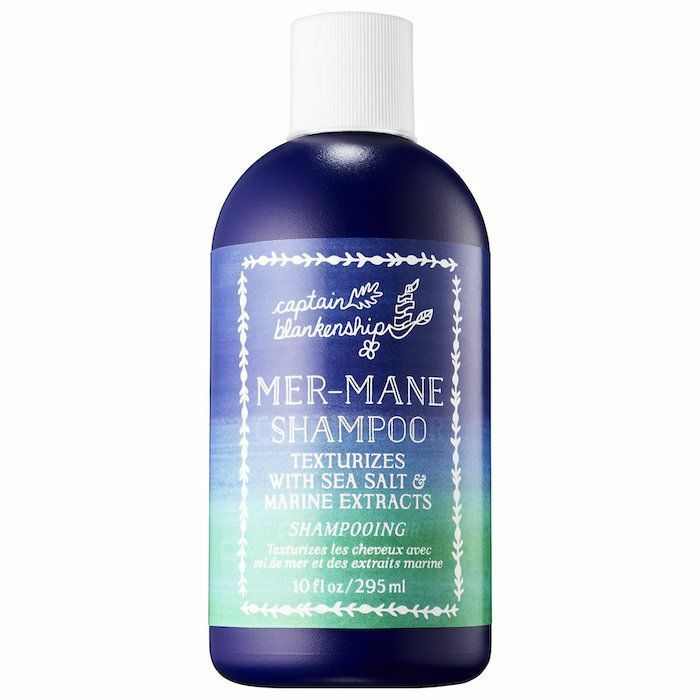 "We use aloe vera in many of our own haircare products, including our Mermaid Sea Salt Hair Spray ($24), Golden Waves Shimmer Spray ($28), Mer-Mane Shampoo ($34), and Mer-Mane Conditioner ($34)." She explains that the value of aloe vera goes beyond just moisturizing dry hair (although who wouldn't count that as being a benefit enough?). "It is naturally antibacterial, antimicrobial, and anti-inflammatory and promotes hair growth, eases itchy scalp, and helps control dandruff." In other words, it can be something of a miracle salve for a dry winter scalp, which is when the majority of people seem to struggle the most with itchiness and dandruff. Nunzio Saviano, owner of Nunzio Saviano Salon in NYC, second Blankenship, telling us it can stimulate hair growth, making it a worthy treatment for people with thinning hair. You can add aloe vera–infused haircare products into your routine to reap these benefits or you can go straight to the source: the plant itself. Simply slice open the spindly stalks to reveal the gooey, cooling, nutrient-rich goodness that's inside. Then you can apply it straight to your hair as a deep-conditioning treatment or "you can make this process simple by purchasing pure aloe vera gel, adding 1 teaspoon to your current shampoo in the shower and massaging in," Scott says. "You can also add it to your favorite conditioner, comb through root to end, and leave on for 30 minutes as a deep treatment." Saviano says to "treat it as you would coconut oil" when applying it to your hair. In other words, apply it, comb it through, and rinse out. Just be warned that it can leave a residue on the hair, so thorough rinsing is necessary. Scott agrees. "If you have fine, thinning hair aloe vera can be heavy and therefore you lose body and volume," she says. So if you do have thin hair, make sure to rinse it out long before styling. Or, as was noted before, you can purchase hair products that are infused with aloe vera for easier application and removal. "There is a great [shampoo] called Jason Aloe Vera Shampoo ($9), and 84% of the formula contains the aloe vera ingredient," Scott says. Just like coconut oil, aloe vera is a versatile and customizable DIY beauty ingredient. Whichever way you choose to incorporate it into your hair routine, know that you're getting moisturizing, growth-inducing, nourishing, anti-inflammatory, and anti-dandruff benefits. As Saviano puts it, "the benefits of using aloe vera are great. It just takes a little more maintenance."